The combination of beans and grains can be an ideal low-fat, cholesterol-free alternative to meat. white beans - ½ lb. Smoked Garlic Seasoning (or to taste) - 1 tsp. In large pot, cover beans and soak overnight. Drain, cover with water and simmer 20-30 minutes or until tender (but not split). In a large pot or Dutch oven, heat oil, add celery, onion, red pepper and Smoked Garlic Seasoning, stirring well. Heat until vegetables are tender. Add chicken broth and tomatoes. Bring mixture to a boil, reduce heat and simmer, covered for 25-30 minutes. 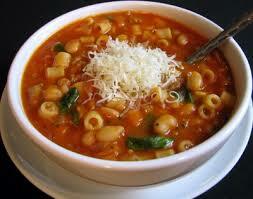 Add white beans and cooked pasta. mix well. Cook 5 minutes longer or until warmed through. Season to taste with salt and pepper. 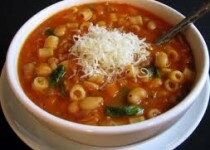 Spoon into bowls and garnish with grated parmesan cheese.